Create a great gift the whole family can be apart of with Pumpkin Patch Customizable Coffee Mugs. Grandma, Grandpa, Mom or Dad will enjoy waking up on a chilly fall morning to drink their favorite coffee when they use their own personalized Mugs. Your Custom Printed Halloween Coffee Mug is Dishwasher safe and holds 11 oz. Includes FREE Personalization! 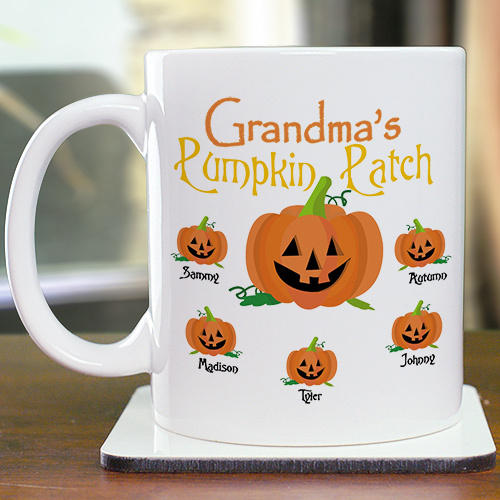 Personalize your Pumpkin Patch Coffee Mug with any title and up to 30 names. Purchased this item for my wife. We have many grandkids and she likes showing it. I ordered it and it arrived very quickly. I turned out better than I could imagine..
Get your Halloween Gifts & Decorations today! GiftsForYouNow.com has a large collection of Personalize Halloween Gifts filled with Halloween Apparel for adults and children to Personalized Halloween Teat Bags. Also, be sure to decorate your home with our festive Halloween Decor.